Wide receiver Cordarrelle Patterson finished third on the Vikings with 45 catches for 469 yards last year. 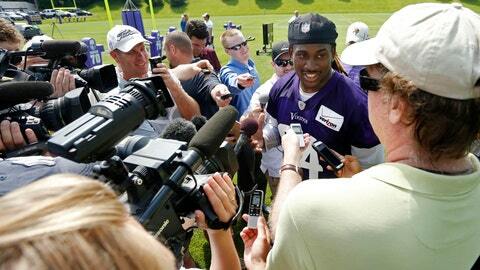 Cordarrelle Patterson insists he still has some tricks up his sleeve after a big rookie season with the Minnesota Vikings. The outspoken receiver isn’t sure how he will follow-up on a first NFL season in which he became the league’s most dangerous kickoff returner with a Pro Bowl appearance and progressed as a receiver and returner. But Patterson, never shy, knows he’ll have a surprise or two in store. "This year I’m going to try and pull something different out," Patterson said at the team’s mandatory minicamp last month. "I don’t know what it is, but I feel like I can get better and improve on my game. When this year comes, I hope I can show the fans and everybody something a little different." Even a slight improvement, given all Patterson’s natural athleticism, might be enough to take the league by storm. While Patterson is waiting to see what his next trick will be, his teammates are seeing the differences and the way he might catch opposing defensive backs off-guard. "I just think his route-running and his ability to recognize defense," quarterback Matt Cassel said of where Patterson has shown the most progress. "I think that’s huge for him, and any receiver, as you move forward. The key component, I think, is understanding defenses and how they’re trying to attack you and how you work your different releases." When Minnesota gave up four draft picks to trade back into the first round last year to draft Patterson, his physical traits made teams excited about the potential. But Patterson, after only one year of major college football, was more projection than production. The 6-foot-2, 220-pound Patterson was versatile, making an impact as a returner, runner and receiver at Tennessee. The athleticism and versatility didn’t come without its faults. Patterson was considered raw. He was not a precise route runner. He succeeded on natural ability. "The most obvious thing, and you see it when he returns kicks, is he’s a natural runner," new offensive coordinator Norv Turner said. "He’s got great instincts when he gets the ball in his hand and he makes great run decisions. He’s got great vision. I think from Day 1 to now he’s improved as a route runner. He’s been very serious about working as a route runner." His transition to the NFL was slow — at least as a receiver — whether due to his learning curve or the previous coaching staff’s decision to ease him into the offense. He returned two kickoffs for touchdowns, including one in his second regular-season game and later tying the NFL record with a 109-yard return. Through five games, though, he had five catches for 85 yards. Slowly, Patterson’s role on offense began to increase. He finished third on the Vikings with 45 catches for 469 yards. "I still watch film on last year’s games to see how I can get better as a person, on and off the field, just trying to help improve my game," Patterson said. "Just watching that film, I see a lot of things I can improve on and get better." The final six games from 2013 might highlight some of the tricks Patterson can unleash this season. He had a season-high eight catches against Green Bay. He caught five passes for a season-high 141 yards two weeks later. He had three receiving touchdowns in three of the final four games. He was used more out of the backfield, as well, and had rushing touchdowns in three of the final five games, scoring at least once in each of the season’s last five games in all. His role should expand again this season. He practiced as a starting receiver throughout the summer. "It feels kind of good working with the 1s," Patterson said. "At the end of the day, you’re spot can be gone, so just going out there working hard, make sure your spot is secure." 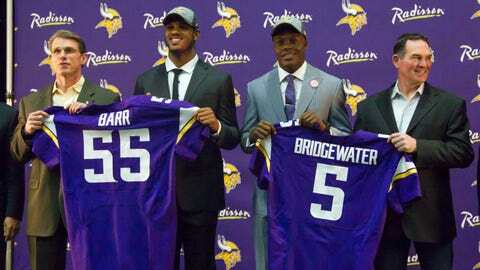 Patterson kept up his tutelage under receivers coach George Stewart, who was retained by new head coach Mike Zimmer, and veteran receiver Greg Jennings. Stewart and Patterson have developed a relationship since before Patterson ever became a member of the Vikings. So, Patterson and Stewart attacked the weak point of Patterson’s game. "I think George Stewart has done a great job with him, the details of running routes," Turner said. "He’s so explosive when he comes off the ball the way he’s capable of coming off the ball. He creates problems for defensive backs. I think he’s made great strides." Turner is getting his first exposure with Patterson. Cassel helped Patterson’s production increase while starting at quarterback the final four games. "Obviously he’s made a tremendous amount of progress from Year 1 to Year 2," Cassel said. "I think the offseason was huge for him in terms of his progress and just being able to really learn. He’s still a young player. He only played a year in college and he was a year at JC and now only a year here, and he played sparingly last year for us at receiver. But I think this has been a huge offseason for him to learn, to see Greg do it last year and now to kind of start to apply it more in this offseason." Which could lead to a few more surprises for the rest of the league.